There is a gravel bank on the inside of the meander at one of our sites on the River Ehen and we get a pretty good idea of how high or low the river is as soon as we see how much of this bank is exposed when we arrive. 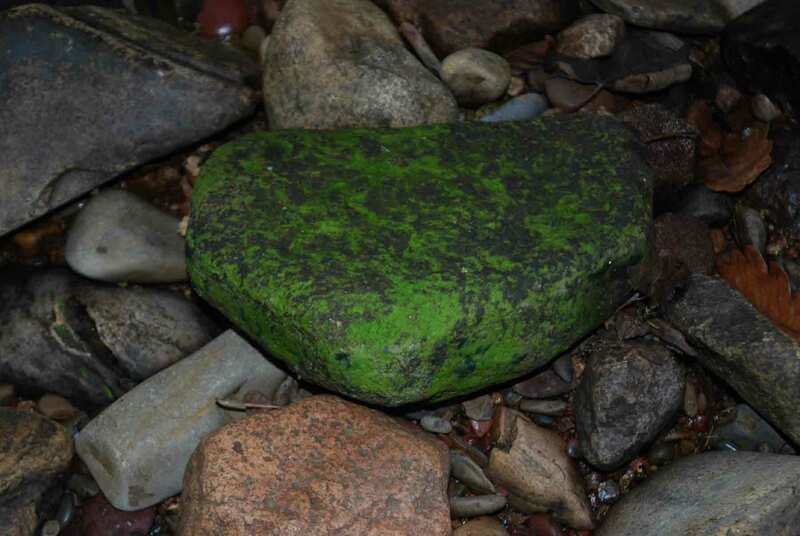 When the river is low, there is always a zone just above the water line where many of the stones are covered with a bright green film of algae. Under the microscope, this turns out to be composed of narrow unbranched filaments of an alga called Klebsormidium flaccidum, a member of a small genus of green algae that are often found in habitats that are not fully submerged or only periodically damp. A single chloroplast encircles half or three-quarters of the circumference of each cell. As is often the case with filamentous green algae, naming the genus to which it belongs is relatively straightforward but deciding the name of the species is much more difficult. The problem is that there are so few diagnostic characters available to differentiate one species from another and that the algae are naturally variable (think about how different a houseplant looks when grown in the shade to on a well-lit windowsill). Fabio Rindi, who wrote the key in The Freshwater Algal Flora of the British Isles, suggested that his key was provisional and that we should really grow the species in culture and extract its DNA if we want to be sure of it’s identity. This all creates a problem for ecologists who want to use algae to infer properties from the environment as much of the literature about these species is scattered liberally with errors made in good faith by earlier generations of biologists. We have to pick our way through their conclusions with great care and, regrettably, often find that generalisations based on the properties of the genus are the best we can do. A filament of Klebsormidium flaccidum from the River Ehen, November 2013. The scale bar is 10 micrometres (= 1/100th of a millimetre). Rindi, F., Guiry, M.D. & López-Rautista, J.M. (2008). Distribution, morphology and phylogeny of Klebsormidium (Klebsormidiales, Charophyceae) in urban environments in Europe. European Journal of Phycology 44: 1529-1540.